Issue 154 is out today! Mag art style seems different this issue? Had a good flick through today. That cover is the best one in bloody yonks! Quake article - very very good. Such a classic series of games with such amazing memories. Starstrike - Not a Speccy lover but did play these a fair bit on my mates speccy and loved the 'starwars' feel. Nice article. Off to read a bit more. Enjoyed the DOA article quite a bit, have a real fondness for the series. Fast and fluid, the counter system makes for great matches. Visually it's always been great too. And unlike bloody Yoda in Soul Calibur, the Spartan in DOA4 was a great guest character that fit right in. I haven't been following the Chameleon kerfuffle, but made for a depressing read. I hope Mike Kennedy can recoup some of his money, if his account is true. Renegade, Cobra, Desert Strike, Top Gear and Microids archives and a very cool cover too. 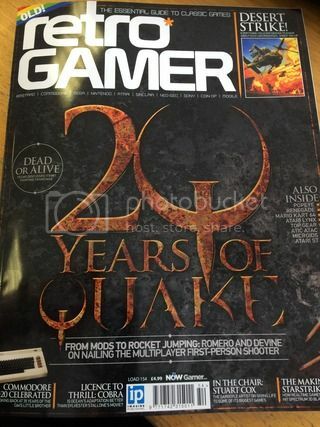 Thoroughly enjoyed the Quake retrospective, delighted to see the Stuart Cox interview (giving some insights into Gargoyle/FTL) and another great company feature from David. Not a bad issue, i liked the Desert Strike article. Havent got round to the Croc or DOA ones yet! Great cover. Love Quake so that helps ! Solid issue for me. Nice mix of old and new. Seems either many people don't buy the mag or don't post. Not an obligation but these threads used to have dozens of posts. sscott wrote: Solid issue for me. Nice mix of old and new. Seems either many people don't buy the mag or don't post. Not an obligation but these threads used to have dozens of posts. Must admit that I only buy the issues with enough to interest me these days. Time was I'd buy every one and read all the articles (even if they didn't particularly interest me that much) but I just end up with a backlog of mags. Will be getting this one however as Croc, Dead or Alive and Desert Strike are all favourites of mine. How do you get through the mag so quickly? Or am I slow? I've only just got past the Back to the nineties article. Good to see Videogame Nation get a mention. I only recently discovered the show and I really enjoy it. It is odd to see actual video game journalists on TV. from memory, the ones with dozens of posts after that had a high percentage of people complaining about ridiculous things that didn't cater exactly to their specific retrogaming wants, and then big arguments resulting from them. Also, international subscribers (at least where I am) also don't get the mag for several weeks after it comes out in the UK. I'd imagine if the mag wasn't popular it wouldn't be getting made each month.